Jack's Opinion: Google offers $6 Billion for Groupon, why is this important? Google offers $6 Billion for Groupon, why is this important? "Google’s $6 billion bid for Groupon, an online coupon start-up, is an aggressive move by the company to dominate local online advertising and help with its long-sought move into social networking. Google has offered Groupon $5.3 billion, with the promise of $700 million in performance bonuses for management, according to a person knowledgeable about the matter who spoke on the condition of anonymity. Several people close to the deal said Groupon, which is based in Chicago, was expected to approve the acquisition and an agreement could be signed as early as this week." The question is what does this mean? First of all it means that google did their highest offer yet for a start up company. The highest investment before was $3.7 billion when google bought double-click, an adserver company. Second Google will have 3100 more employees. 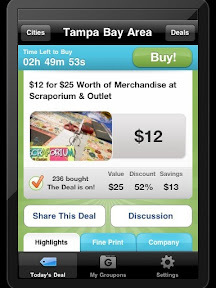 Groupon did hire in the last two years over 2900 people to run their business. Third the founder of Groupon might get a high management role for local advertisement, eventually CRO local advertisement. But how will Google benefit from this deal. Google is number one company for online advertisement, but did miss two important new movements or was not able to gain momentum. The biggest social network is Facebook with over 500 million users world wide. The second biggest is myspace (source: about.com ). But none of the top social networks are related to Google. With Groupon Google is getting into a social network which can be easily in the top ten. Right now Groupon has only 35 million subscribers, but a pretty high usage rate. Google does need to bit very high otherwise the chance is high that Facebook or Microsoft would buy Groupon. Local online advertising is expected to grow 18 percent, to $16.1 billion, next year, according to the advertising research firm Borrell Associates. Google is not good yet with their business model with local advertisement. Groupon can help Google to get a bigger piece of the projected local advertisement. Right now Groupon is very attractive. For businesses because they can easily generate $1 million extra revenu in one day (like GAP). And it is attractive for consumers because the deals offered are sometimes up 80% discount. Groupon always offers only a few deals at the time for a city. This is a very scarcity effect. If you don't buy the deal the next day it is gone. The deals are time limited and requests a minimum of buyers to make the deal happen. However some companies are complaining that they have to offer too much discount and that Groupon takes a too high share (I heard it is 50%). Other companies are saying that Groupon drives a lot of traffic to them but the people don't come back after they used the coupon. Google could take the viral effect away by trying to offer too many deals at the same time and less discounts to get more advertisers. On the other side google can help Groupon to explode. I believe the best thing for Groupon and google would be if Google does not interfere with Groupon management and let Groupon run their business. And the $6 billion are helping a lot to grow. "Small cattle does make dirt as well. A lot of small cattle makes a lot of dirt." Which means small advertisement revenue from a few local stores is nothing, but advertisement revenue from 10% of all stores in the US or world is a lot. Now important to know is that most countries (not the US) have thousands of family owned small stores and restaurants. France and Germany have almost no national restaurant chain, but alone in Paris over 500 family owned restaurants. Is Apple changing the connector on their iPhone? iPhone at Verizon but why not Sprint or T-Mobile?